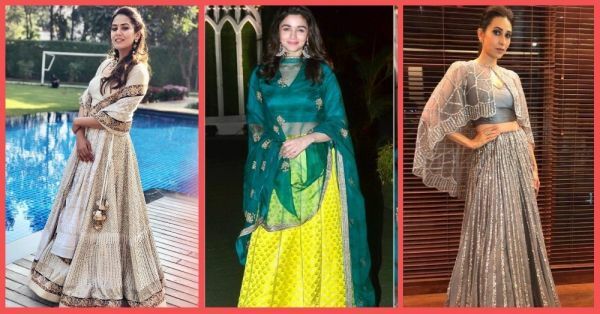 From Glitzy To Glam, Here Are 10 Bollywood Inspired Lehengas To Wear At Your BFF’s Shaadi! The brightest and probably one of the most loved outfit, Alia Bhatt looked stunning in this Raw Mango lehenga. With minimal accessories and make-up, she accessorized this desi chic look with chaandbalis and a small black bindi, which looked oh-so-pretty! Hello yellow! Shine at your bestie’s wedding with this beautiful yellow lehenga saree by Arpita Mehta. You can take cue from this outfit for your bestie’s mehendi/wedding ceremony and drape the dupatta just like she has, so that it remains in place and you can dance the night away. This Yellow Floral Embroidered Lehenga (Rs 66,000) is the perfect blend of pink, orange and yellow. Athiya Shetty’s pretty pink and orange lehenga is what every bridesmaids outfit dreams are made of! With beautiful chaandbalis and a mirror work potli bag, the colourful look can work both at day weddings as much as evening ones. Aditi Rao Hydari always has her fashion game strong. This time around, the beautiful actress wore a royal blue Banarsi skirt along with an off shoulder velvet blouse, which looked just so pretty! With just a choker necklace and minimal make-up, this look can perfectly complement a cocktail night. Navy has been THE colour for the wedding season and Diana Penty made this desi avatar look even more beautiful with her Anita Dongre outfit. This traditional gotta patti lehenga paired with chaandbalis and smokey eye makeup can be the best choice for your bestie’s wedding function. The pretty Mira Kapoor wore a chikankari ivory kamdani lehenga with Parsi Gara border and looked nothing less than a goddess! With a beautiful set and a bindi, we think this look would work great at a morning wedding function. “Straight Out Of Eden” as described by Abu Jani & Sandeep Khosla himself, Shraddha Kapoor looks mesmerizing in this floral resham lehenga. A soft colour with beautiful floral resham work and a side ponytail, would look great especially if you are looking to colour coordinate your outfits with other bridesmaids. This is an offbeat but beautiful lehenga choice that is not for the faint hearted. The peplum style of the blouse along with the cape -attached dupatta makes this lehenga such a fusion outfit, which can be worn on a cocktail night or even the wedding day. With no stress about the dupatta, this cape lehenga by Neerus India is such a gorgeous choice to wear on your bestie’s shaadi. An off-beat colour with beautiful and minimalistic work, this look is definitely one of our favourites!